I want to help my students become the flutist they want to be, not the flutist I want them to be..
My teaching style is one of discovery. I started teaching only two years after beginning private lessons myself. You could say learning how to teach happened concurrently with learning how to play the flute. As a teacher I like to ask questions and lead students to the right answers, rather than just giving answers. I feel it's important for students to figure things out for themselves through exploration. As a result students come and go with big smiles because they look forward to what they are going to discover. I support a dynamic where the teacher and student work together. I honor all students, because it takes courage to admit there is more to learn. I help students achieve what they want. This creates a sense of joyfulness rather than obligation. Students learn that their accomplishments are because of priorities set, time management and knowing what is important to them. Learning how to play flute is often a vehicle for developing personal responsibility, planning a schedule and gaining a sense of control and power in the world. Students learn to do work to please themselves — not others. Individual attention is the cornerstone of private lessons. Students will get out of a private lesson what is essential for them. Lessons are private time with an adult. Students get to practice being a young adult, and therefore the bar for achievement is raised higher than in school band or orchestra settings. The sky is the limit as far as one can grow: students are not confined to the band repertoire or only hearing how the best person in band plays. One of the most important lessons I've learned to teach is to always listen. It may sound simplistic, but so often it is really easy to get caught up in mixed thoughts of how one should sound or how one is supposed to play; of what others think or say; of what someone wants to hear at an audition or of what someone else didn't like. Ultimately it comes down to listening and analyzing in specific detail. The goal is to get rid of blanket "good" or "bad" statements, to really hear the playing and then decide what is wanted. By accepting where they are and where they want to go, a student can change their playing. When we stop listening, we become frustrated and poor habits come out. The challenge of teaching is to tune into what students want and what they are ready to incorporate into their playing. My best advice to musicians just getting started in the professional world is to teach. Sometimes being an artist creates dissatisfaction because you feel like the world doesn't understand or accept you. Private teaching connects you with society and brings the joy of contribution. The way in which flutist Ellen Burr shapes her musical creativity is remarkably personal in several aspects. 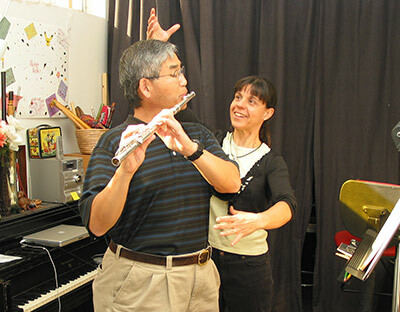 Ellen is available to teach 45 mins and 60 mins private lessons in her Venice flute studio. …Ellen worked with these musicians on three different occasions and made them better players, able to listen to one another and blend as a group. She is positive, patient, gives good performance and playing advice and fun to work with. The students enjoyed her ability to make them sound better and more accomplished. I would recommend Ellen as a teacher to any flute player. I'll say it again: I am SO glad I found you. I can hardly believe my wonderful fortune. The very flexibility of your/our lessons combined with your brains, emotional availability, incisiveness, humor, and professionalism works some magic in which the TRUE points of each lesson are simultaneously allowed to emerge but are also then brought out quickly and specifically, covered thoroughly, and reinforced in effective ways…YOU are GOOD! I think its important to have a teacher you connect with, one to help you connect with yourself and the inner music, along with giving you inspiration, guidance and helping discover yourself and your place as well as going to the next levels of learning and development. YOU are that teacher and person Ellen...honest. I always enjoy lesson time with you and just talking. I think you are inspirational, innovative, and teach flutists what musicality and being a musician is ALL about...you teach from your soul...and it is WONDERFUL:) Thanks. I just wanted to thank you for inviting me to participate in the flute party. I had a wonderful time! I think that the flute party is a great way to get students to become comfortable with performing since there are no formalities such as those that exist with recitals or concerts and the flute party provides such a great relaxed and supportive atmosphere for all of the participants. I really enjoyed myself and it was great having a reason to practice again. Thanks for rekindling my desire to continue to play the flute. All of the best. Boy, did I hear some wonderful music today. These are some very accomplished players. I thought everybody did an excellent job. I congratulate you, their teacher. If I were one of the parents, I would certainly think I was getting my money's worth. So, you can count on me showing up again to soak up some of that inspiration.